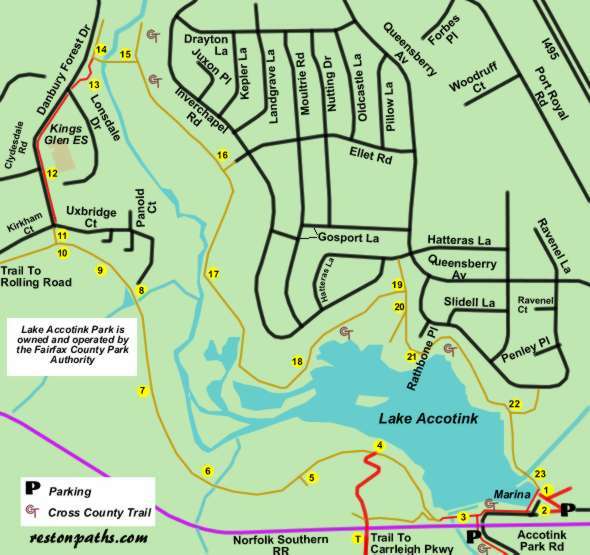 The Cross County Trail (CCT) utilizes part of the trail system around Lake Accotink between points 3 and 15 on the above map. Look for the CCT symbol on the map to determine the trail route. Click here for a map in pdf format for printing. The walk starts at the lake adjacent to the marina. Take the concrete sidewalk along the front of the marina to the steps and road on the south side. This portion of the trail is part of the Cross County Trail (CCT). Turn right and take the asphalt trail along the road leading towards the dam. The CCT turns left at the next asphalt trail intersection and passes between the road and the parking lot. Since we are leaving the CCT at this point continue straight on the current trail as it passes the dam. A picture shows the activity at the dam on the first day of the fishing season. Take the asphalt trail up the hill past the dam. At the top of the hill the path changes back to a natural surface. It will soon make a sharp right turn to continue along the lake. The intersecting natural surface trail to the left follows the railroad tracks up to a path to Carrleigh Parkway. Continue straight on the present path as it continues along the lake. An asphalt trail intersects on the left. This is the official trail to Carrleigh Parkway. The trail crosses the railroad on a bridge offering an excellent view for train spotters. Unless you wish to make a side trip to view the railroad continue straight on the natural surface trail. Another trail intersects from the left. It connects with a series of mountain bike trails in an area where silt from the lake was pumped a few years ago. Continue straight on the present trail. The fence on the left appears to be protecting trees along the trail from beavers. The trail from this point on runs along the fill from an abandoned railroad bed. You can look down on the lakebed from this location when the leaves are off the trees. The path passes through a cut in the hill that was also created for the abandoned railroad bed. Houses appear on the right. The path is slightly higher than some of the roofs. This is the first sign that you are nearing a trail where you must turn (step 10). Markers have been placed in this section to identify some of the local trees. Turn right at the next intersecting asphalt trail. A sign (pictured) marks the trail. The trail goes down a short steep hill to Danbury Forest Drive. At Danbury Forest Drive take the sidewalk on the right side of that road and walk up the hill. The sidewalk passes Kings Glen School on the right. After crossing Loisdale Drive take the asphalt trail down the hill as it curves to the right. Turn right at the first trail and cross the bridge over Accotink Creek. After crossing the bridge the trail ends at an intersecting trail. This is the Cross County Trail (CCT). Turn right and follow that trail along the stream on the right. Houses should be on your left. A trail connecting to Ellet Road intersects on the left. Continue straight on the present trail. The trail rejoins the creek on the right. The houses to the right are on Uxbridge Court. They can only be seen when there is no foliage on the trees. The trail turns and the lake becomes visible on the right. A large group of sea gulls are shown near one of the islands in March. Turn right at the next major trail intersection and cross the stone culvert. The trail to the left leads to Hatteras Lane. After a short distance a dead end trail leads to the right. Continue straight on the present trail up the hill. The trail makes a sharp turn to the left. The railroad bridge and dam appear across the lake. The trail crosses a gully on a bridge. The intersecting trail to the left after the bridge goes to Ravenel Lane. Take the trail to the right to continue around the lake. The trail leaves the woods and crosses a bridge. After reaching the marina just beyond the bridge the walk is completed. The CCT turns right to follow the concrete sidewalk in front of the marina (see step 1).